In 1927, Immanuel Lutheran Church experienced a major schism amongst its parishioners. The dispute over doctrine led 40 families to leave and, on May 20, 1928, form Christ Lutheran Church. Two months later they called Pastor Arnold Dornfeld as their first pastor. Under his leadership they chose to build a church on the corner of 3rd and Walnut, a building which was completed and dedicated on February 10, 1929. 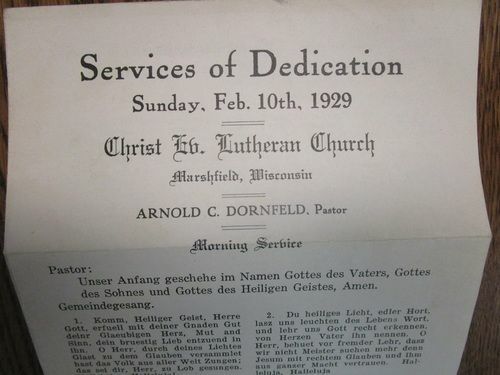 Pastor Dornfeld served Christ Lutheran Church until 1944 when failing health caused him to step down. The call committee then convinced Pastor T.P. Bradtke to leave his teaching job at a Lutheran High School and become Christ Lutheran's second pastor. He went on to serve here for 43 years. 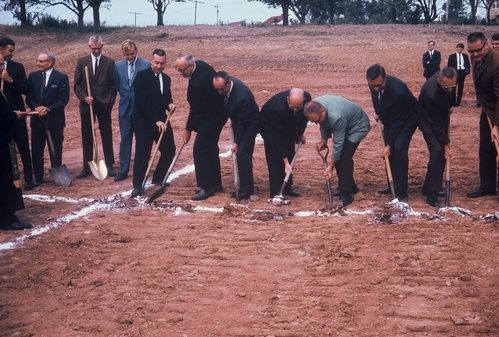 Pastor Bradtke's years as pastor saw the end of German services in 1959, the switch from the Wisconsin Synod to the Missouri Synod in 1964, and the building of a new church building, the current Christ Lutheran Church, in 1969. In 1986, near the completion of the multipurpose room and new Sunday School rooms, Pastor Bradtke announce his intention to retire. Pastor Bradtke retired on September 13th, 1987 and a week later Pastor Mark Krueger was installed as the third pastor. As of 1990, the congregation had grown to 1440 baptized members and so decided to call another pastor to serve alongside Pastor Mark. In July of 1990, Pastor Stewart Crown was installed as the first assistant pastor. He resigned two years later to continue his studies. In 1993, Pastor Steven Chellew was called as the second assistant pastor. His wife, Val Chellew, and Pat Retz organized the preschool in 1995. The preschool was at the church for 17 years. Another addition to the church was dedicated on April 13, 1997. This building project included the choir room, additional offices, the education wing, and a kitchen remodel. One year later, Pastor Steve accepted a call in Iowa which led to the calling of Pastor Daryn Bahn as associate pastor. He was installed on April 18, 1999. In the meantime, Tammy Schwartz was called to serve as Director of Christian Education and was installed on August 9, 1998. 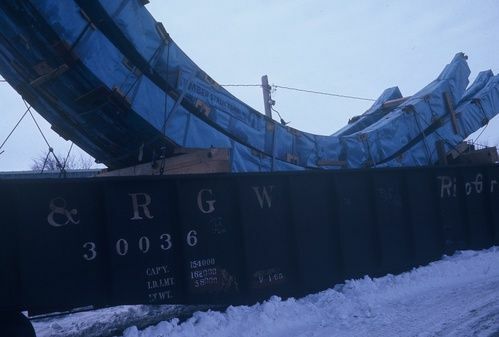 2002 saw the completion of a renovation project ahead of the 75th Anniversary celebrations in 2003. 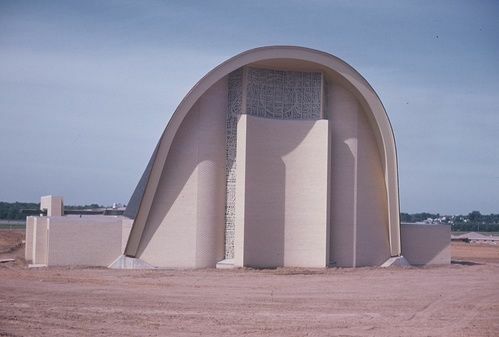 The project included refurbished pews, new carpeting and tile for the sanctuary and narthex, a redesigned parking lot, and a new sound and lighting system. The next few years saw the purchase of a new organ, a new metal roof, and the planting of the Bradke Memorial gardens. A fountain was added to the gardens in 2013 in honor of Pastor Mark and Sandy Krueger. In 2012, the church saw another major change when Pastor Mark retired on August 19 after 25 years at Christ Lutheran. A call committee was formed. At the annual meeting in January 2013, the congregation voted to make Pastor Daryn senior pastor. The committee then started the process of calling a new associate pastor. After exploring several options, the committee decided to pursue calling a pastor right out of seminary. Six members went down to Saint Louis in January of 2014 to interview four soon-to-be graduates. Three months later at the Seminary Call Day service, we learned that Pastor Andrew Wilson and his wife Brianna were placed with Christ Lutheran Church. On June 29th, 2014, Pastor Wilson was installed and ordained as only the seventh pastor to serve this congregation. In the first week of November 2017, Pastor Wilson and 5 other members of the congregation went to Guatemala for a mission trip. This was the first mission trip in our Congregation's history and was well supported. Plans are already in place to go back to Guatemala in 2019. On November 19th, 2017, Pastor Wilson announced that he had accepted a call to Trinity Lutheran in Zanesville, OH. A Call Committee was formed at the 2018 January Voter's Meeting. They interviewed several candidates at the Concordia Seminary in Saint Louis in mid-February. On April 24th, we found out that Andrew Belt, his wife Rebecca, and their two boys, were placed here. He was installed on June 24th, 2018. On January 2nd, 2019, due to an anonymous donation, we paid off our mortgage a few months early. Christ Lutheran Church is now debt free. 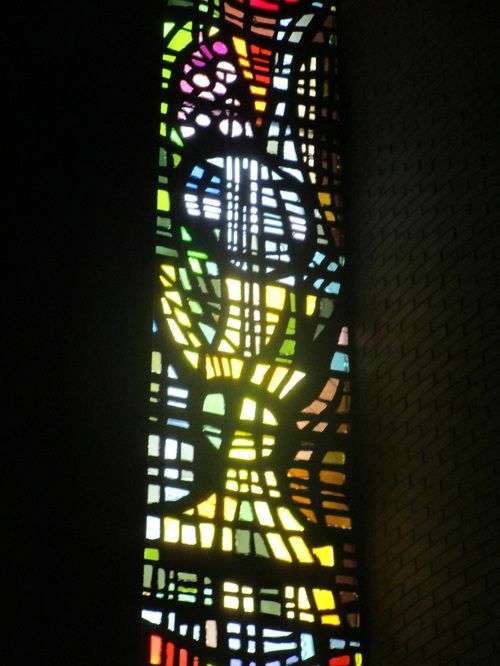 "In designing and fabricating these windows, I thought of the people at worship and a motif appropriate to the design of the building. What I have done is simply an illustration of the doxology in our Lutheran Hymnal, - "Praise God, from Whom all blessings flow: Praise Him, all creatures here below; Praise Him above, ye heav'nly host; Praise Father, Son and Holy Ghost." This is one of the six great hymns of the church. We have across the top the symbol of the Trinity. The circle of the Father, then the flame here, and there is a dove shape representing the Holy Spirit. The major dominant theme of the whole top part - not just the circle but the cross is the symbol of the Son which are drops of blood coming from the cross. On the left side as you face the chancel, the blood refers ultimately to the celebration of the Lord's Supper. There is a chalice, a host, the grape and wheat. ON the right side is the fire which ultimately refers to the water and the shell of baptism. So we have describes for us the major sacrifice. Beneath these we have another reference to a third sacramental from the Lutheran Liturgy and that is the "Word." It is not a Sacrament but it is a sacramental element. On the right side we have a book with open pages and on the left side we have a scroll from the Old Testament. Beneath that on both sides we have "all creatures here below." On the left side we have the sun and the rain, growing trees, houses, in fact, even factories with smoke coming out - obviously very, very abstract. On the right side we have the crescent moon and the stars. So you have night and day, sunshine and rain - the whole world in a geodesic glow. Beneath it, representative of all people on earth, are the colors of men - black, red, yellow, white, and brown. In fact, there is a little pagoda shape on the right side and beneath that a family, people, father, mother, son and daughter. In other words, the window is the faith life of the Christian Church on earth and one over-arching act of praise. I feel it is a happy, joyful, celebrated kind of thing. The windows in the nave are to carry out further this theme of "Praise God" but this time it is nature and life itself which praises God. 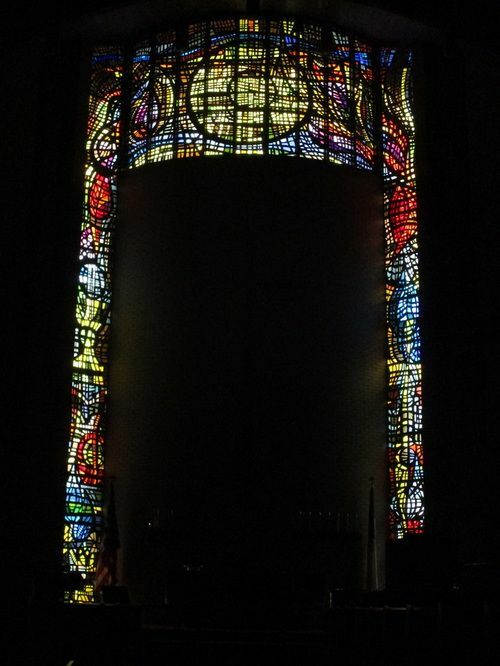 Here on the left side of the nave, facing the chancel, the first windows from the rear of the nave is Morning with the sun rising in all its color. The second window with its green and yellows, Nature Growing, represents the springtime of the year. 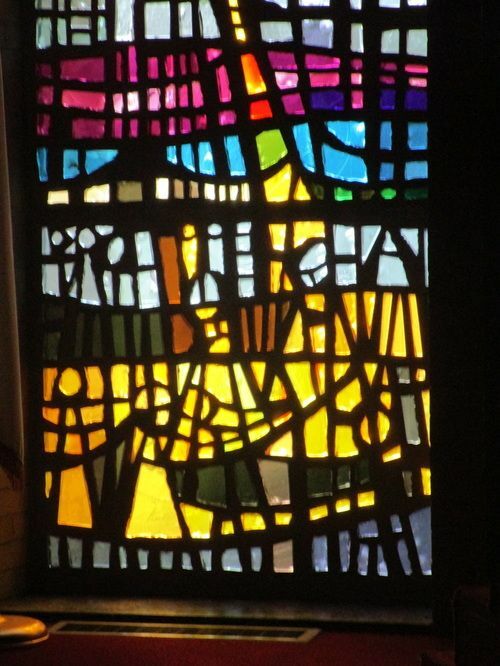 The third window with the sun at its highest point, and its rich colors gives us the season of Summer. Then, following the windows on the right side to the rear of the nave, the first window shows us the season of Fall, with the sun a little bit lower in the skies and there are the colors of that season. The next window with the sun still lower brings us the season of Winter. This is shown in the grays and blues. The final window brings us to Evening with the setting sun - a bit of color here and there. But these windows are also life itself! 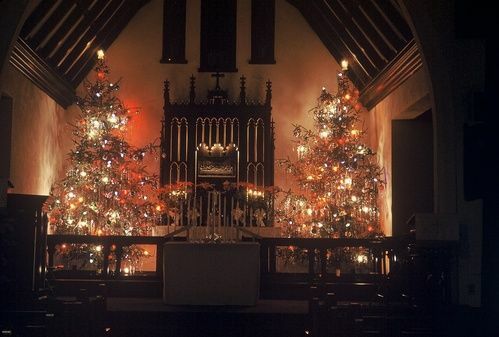 From the last window we turn once more to the chancel area and its windows bringing us the message of salvation in Christ."